Right now, the Koch Gang and the Rove-bots have 9 sick, illegal ways to steal this election: More than 5.9 million votes are at risk. It could be yours. Click on the Poster/flyer to download it, then send it around, email it, Facebook it, sky-write it ”“ or click on the color poster and print it out. Stick it up at your Zumba class, your Tea Party sleeper cell tree-house, and your church. Every state now lets voters cast ballots in designated polling stations and at county offices in the weeks before Election Day. Do it. Don’t wait until Election Day to find out you have the wrong ID, your registration’s “inactive,” (9.9 million of you) or you’re on some creep’s challenge list. By Election Day, if your name is gone or tagged, there’s little you can do but hold up the line. Think you’re registered to vote? Think again, Jack. With all this purge’n going on (13 million and counting), you could be x’d out and you don’t know it. So check online with your Secretary of State’s office or call your County Board of Elections. Then register your girlfriend, your wife, your mailman and your mommy. Then contact the Rainbow PUSH Coalition, the League of Women Voters and Rock the Vote and commit to a couple of days of door-to-door registration, especially at social service agency offices. In Florida, that means you’ll get arrested. I’ll send a file in a cake. In 2012, they’ll be handing out provisional ballots like candy, a couple million to Hispanic voters alone. If your right to vote is challenged, don’t accept a provisional ballot that likely won’t get counted no matter what the sweet little lady at the table tells you. She won’t decide; partisan sharks will. Demand adjudication on the spot of your right to a real no-BS ballot from poll judges. Or demand a call to the supervisor of elections; or return with acceptable ID if that’s the problem. And be a champ: defend the rights of others. Then challenge the challengers, the weird guys with Blackberrys containing lists of “suspect” voters. Be firm, but no biting. The revolution will not be podcast. Let go of that mouse, get out of your PJs and take the resistance door-to-door – to register the vote, to canvass the voters, to get out the vote. Donate time to your union (if you’re not in a union, why not?) or to the troublemakers listed in Action Groups at www.BallotBandits.org. This may seem a stupendously unoriginal suggestion, but I know of no other method more effective for confronting the armed and dangerous junta that would seize the White House. Voting, like bowling and love, should never be done alone. As our sponsor, the Rev. Jesse Jackson says, make a date to ”˜Arrive with Five.’ And keep a copy of Billionaires & Ballot Bandits in your holster, our website on your iStuff (we’ll have help lines on our site), and a photo ID that matches your registration name and address. And Bobby, make sure your ID says, “Robert F. Kennedy JUNIOR” ”“ or your vote is toast. 7. Make the Democracy Demand: NO VOTE LEFT BEHIND! I have this crazy fantasy in my head. In it, an election is stolen and the guy who’s wrongly declared the loser stands up in front of the White House and says three magic words: “Count the votes.” You can have all the paper ballots in the world, but if you don’t demand to look at them, publicly, in a recount, you might as well mark them with invisible ink. Democracy requires vigilance The Day After. That’s when you check in at www.BallotBandits.org one more time. Who are these masked men? Who are the Ballot Bandits? 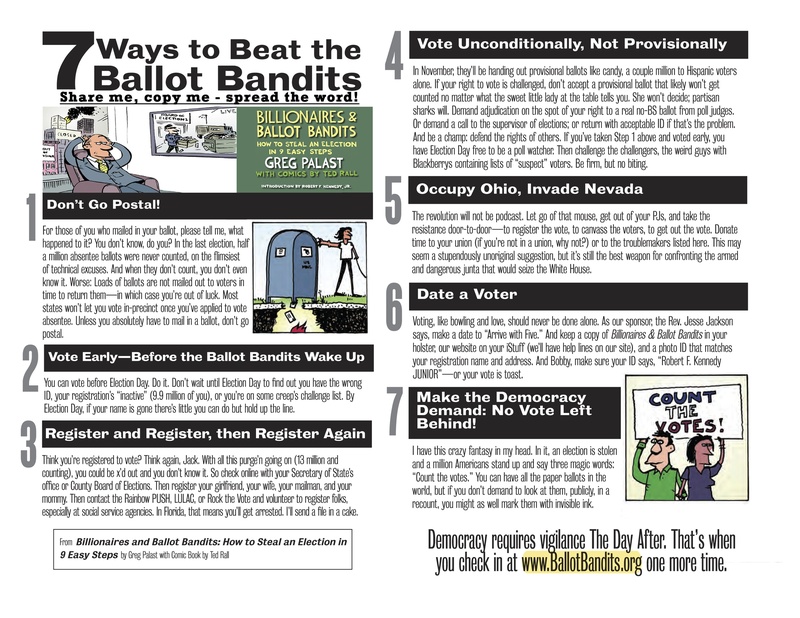 Find out: Get your own copy of Billionaires & Ballot Bandits: How to Steal an Election in 9 Easy Steps, including the comic book by Ted Rall and chapters by Bobby Kennedy Jr. This guide is published by the not-for-profit non-partisan Palast Investigative Fund. To get updates, go to www.GregPalast.com and sign up to for our newsletter.